Do You Need a Linkedin Premium account? LinkedIn and DeviantArt are two major exceptions for the professionals when it comes about Paid Membership. This networking firm reported to have 228M USD revenue per quarter. That may be good news for Linkedin. But the question comes back again and again – Do You Need a Linkedin Premium account? For deviantArt, there is only one type of premium membership, thats too cost quite lower, they offer quite good bundle of offers – deviantArt, unfortunately is neither really for everyone, nor it serves the purpose of Linkedin Premium account or just simple Free Linkedin account. 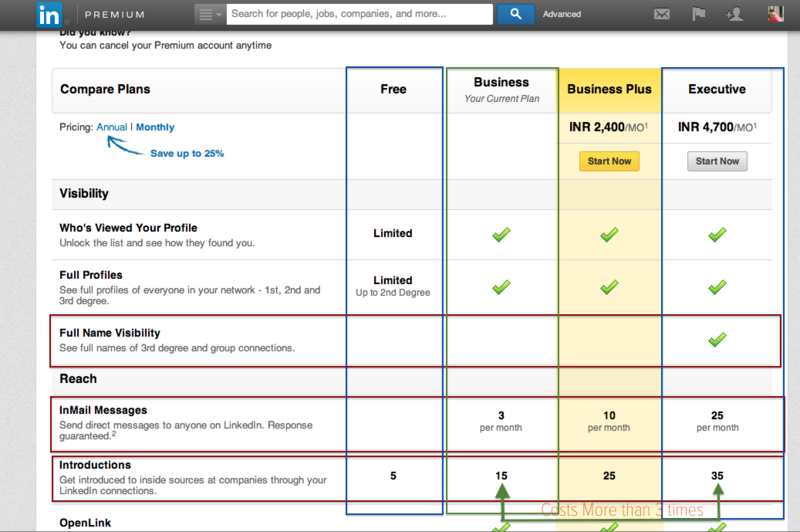 Do You Need a Linkedin Premium account : What is Your Target? If you have read our previous article on Comparing Advertising Options – AdWords, Facebook, LinkedIn, you will understand that, Linkedin, basically takes the advantage of not having a potential real targeted social network of similar niche. One can compare the pricing of Linkedin with Retail version of Microsoft Windows Box Package – a Mac costs a huge for the most, few new users really knows about Linux, the business becomes – simply bundle with the Hardware as OEM copy. LinkedIn is known for providing an amazing connection and networking service, with many of its best and most useful tools available for free but unfortunately, at the minimum cost; the lowest possible Premium Account is really good for nothing. If your target is of high or the need is high – then the lowest Premium Membership practically will be a wastage of money. Frankly, with that monthly payment, one can have a domain, WordPress, a good theme hosted on Rackspace IaaS – comparison is odd, but this just shows up a big thing – one dollar still holds some value. Jordi wrote more good detailed view, it is really good to read. I will suggest to use their Free ride (trial) and cancel it after 20 days. Be careful about date – it is good to have a good margin of time. Again, Linkedin will prompt for Premium membership Trial (usually after 3-4 months for a tested real person’s account) – again run your marketing rule. Linkedin itself is really good, but for the huge pricing – really do not go for it unless you are aware what you are doing. Most, obviously will search on Google web search, you can target with AdWords and land to your domain. Linkedin is not really ‘fast’ like Twitter or viral like deviantArt, deviantArt is viral, it sounds odd but basically the audience are the creators, so it creates a different atmosphere. This Article Has Been Shared 8479 Times! Cite this article as: Abhishek Ghosh, "Do You Need a Linkedin Premium account," in The Customize Windows, January 8, 2014, April 23, 2019, https://thecustomizewindows.com/2014/01/do-you-need-a-linkedin-premium-account/.